SEATTLE – They just keep doing it. Sometimes it’s by way of a comeback. Sometimes it’s by way of a blowout. Sometimes it’s by way of a salvaged victory in a slopfest. But whatever the means, the Huskies just keep winning – to the point where it’s hard to tell when they’re going to stop. The Washington men’s basketball team extended its winning streak to 10 on Wednesday night with a 75-62 victory over USC. Its 8-0 record in the Pac-12 marks UW’s best start in conference play since the 1952-53 season, when it won its first 14 games. 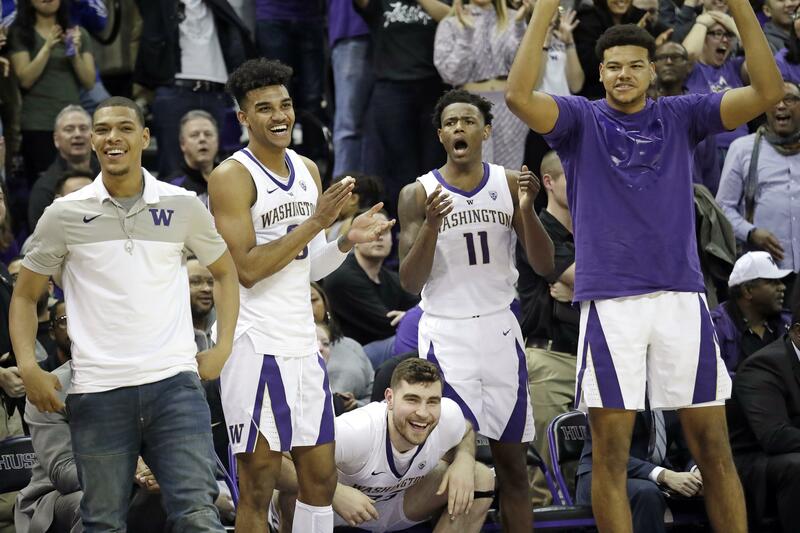 The early success came with a question mark, as the Huskies’ first five Pac-12 wins came against the league’s five worst teams. That question mark, however, has since been replaced with an exclamation point. Advanced apologies for the jinx, but the Dawgs look like the class of the conference. USC, like most of Washington’s foes recently, struggled to get open looks from the outside – finishing just 5 of 16 from beyond the 3-point line. In the previous nine games, opponents were just 28.4 percent from deep. This isn’t supposed to happen against a zone. The 3-ball is typically what teams have to sacrifice when they refuse to play man ‘D,’ yet UW has nearly eliminated it. But the story Wednesday wasn’t the chances the Huskies took away – it’s the second chances they gave themselves. If there has been one area in which Washington has struggled this season, it’s been on the boards. The Huskies entered Wednesday ranked 10th in the Pac-12 in rebounding, just one spot better than where they finished last year. Against USC, however, they owned the glass, finishing with 40 boards to the Trojans’ 28, and 17 offensive boards to their 10. Noah Dickerson did most of the cleaning – pulling down eight offensive rebounds and 14 overall. He added 21 points in what was his best game in Pac-12 play this season. But it wasn’t just Dickerson. Like they’ve been doing throughout this streak, the Huskies offered a sampler platter of contributions to overwhelm their opponent. Conference defensive player of the year front-runner Matisse Thybulle had seven steals and two blocks to go along with his 17 points. Conference player of the year candidate Jaylen Nowell was his usual steady self, tallying 12 points, seven rebounds and five assists while shooting 5 of 8 from the field. And David Crisp put up 15 points as he continues to have the best season in his four years at Washington. I’ve said before that this is the most complete team the Huskies have had in years. They confirmed that Wednesday night. From their post-up game to their spot-up 3s to their interior ‘D’ to the turnovers they force, there aren’t a lot of holes to expose. The argument against the Huskies, of course, is that they’re like the smartest contestant on Celebrity Jeopardy. The Pac-12 is as weak as it has been in a long time and will likely send just two teams to the NCAA Tournament. UW has lost all three of its games against Top-25 teams this year, two of which came by double digits. But compared to the teams in their own league? They’re starting to look like redwoods among pines. Wednesday marked the Huskies’ fifth double-digit win in their past eight games. They drew 9,121 people to Hec Ed and may sell out against UCLA on Saturday. And it’s hard to deny how much of an impact the energy had on the game, especially with Washington jumping out to a 15-6 lead from which USC never recovered. Long night for the other team. Fun night for the crowd. That’s been the story for a few weeks now with the Huskies – and there aren’t any signs it’s going to stop. Published: Jan. 31, 2019, 2:07 p.m. Updated: Jan. 31, 2019, 5:43 p.m.